I'm off to CHA! Please read for pre-ordering information! Well, here we go again-it's already time for CHA! Hardly seems possible, since it feels as if we barely just finished up with everything from the last CHA last summer! I absolutely LOVE the thrill when we first see the hottest new products unveiled (the ones that have been kept "under wraps" until they debut at CHA!!). I especially look forward to everything involved with the Provo Craft events, from their fabulous set-ups within their exhibit space on the Convention floor, to the always fabulous party they have for us Retailers. Now, it's no secret that I am a huge Cricut fan, but even though I do favor and sell their products, I don't think anyone does CHA BETTER than Provo Craft!! I can't wait to see what they're going to show us this time!! What do you all of you think think they're going to WOW us with this time??!! Anything you see that you want me to order for you, please be sure to send me your list of items via email to glendascreativeplace@yahoo.com so your orders can be included in my total count when I place my orders at CHA!! As always, all Provo Craft products are available to be ordered from me. 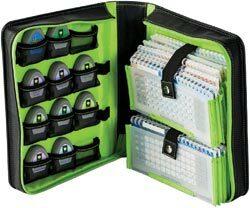 This includes all Cricut, Imagine, Cuttlebug, Yudu (and of course, the newest products!!). Please email me at glendascreativeplace@yahoo.com for prices!! Spellbinders Blog Hop - Donna Salazar and more. Also new Cricut storage and Spellbinders Book finally shipping! SPELLBINDER's Blog Hop!!! Get ready for all the new CHA releases!! FYI, I'm typing this on my phone so it will be very brief (since it takes me forever to post anything from this very "smart" phone, LOL!!). BUT--I wanted to make sure everyone knows that I am going to be taking pre-orders for all the new Spellbinders CHA releases. So be sure to keep your eyes peeled over the next week and a half (or so) on the Spellbinder's blog at http://spellbinderspaperarts.com/blog/ . Each day during the Blog Hop, be sure to click on the featured designer's names to be linked to their blogs (there are usually 2 featured designers with the new Releases/Reveals). In fact today they have a new designer who is one of my personal favorites, and that is DONNA SALAZAR!! WooHoo!!! I LOVE her!!! Many of my regular customers know that for a while now, I have been quietly providing them with the first line of Spellbinder's Compatible stamps that were put out by Donna & those that are Donna-Devotees and have gotten those stamps from me have been having LOTS and LOTS of fun with them!! And just WAIT until you see exactly what Miss Donna Salazar put out today--sooooo cool!!!!!! Email me for prices, but as all of you know, as always. my prices will be amazing!!! Go to my main Provo Craft page for all information by CLICKING HERE. 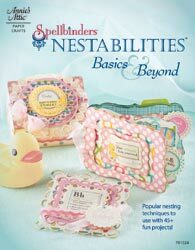 Next new item is the long-awaited "NESTABILITIES: Basic and Beyond", (about using the Spellbinders Nestabilities dies). I've had some of these pre-ordered for a while, and am ordering more based on your requests. Please go to my main Spellbinders page for all information by CLICKING HERE. You may purchase ANY and ALL JustRite Stamps and Custom dies from me, including any of the newer releases from this Winter and the newest releases for Spring. This includes all "ORIGINAL" style JustRite Stamps, as well as the FABULOUS JustRite/Spellbinders Custom dies, and of course all of the new Cling style JustRite Stamps. To see all of the stamps available, please view them all on the JustRite Stampers site at: http://www.justritestampers.com/ . When you get there, just click on PRODUCTS, then go into all the separate categories for JustRite ORIGINAL, JustRite CUSTOM DIES, and JustRite CLING stamps. Make your list of everything that you want, then come back to me to order, because my prices will be substantially less than what you see listed as the MSRP/Retail prices on the JustRite website. To place an order with me, just email your list to me at glendascreativeplace@yahoo.com . Please be sure to include your ZIP CODE, and your PayPal email address (if it's different than the email you're using to communicate with me). And it is helpful if you put something in your email subject line such as: "NEED to PLACE ORDER for JUSTRITE...". You can figure that my prices will be at LEAST 20% to 25% less than what the MSRP/Retail price is on the JustRite website, and on many items, the discount is even greater!! Another advantage to ordering with me is that you can also order OTHER items from different manufacturers (such as Spellbinders, Ranger, Tim Holtz, Copics, etc.) at the SAME TIME, on the SAME order with your JustRite items, so they will ALL ship together in one package, which will save you $$ on shipping!!! If you have ANY questions, please don't hesitate to contact me, either by email at glendascreativeplace@yahoo.com , or you may also call me on my business telephone number during my phone hours (please see the CONTACT ME page for all that information). I look forward to helping you build your collection of JustRite Stamps! !